The Podium Big Chill bottle has a large 25oz capacity and employs a double-walled construction that effectively works as insulation to keep all that water colder, longer. The innovative self-sealing Jet Valve eliminates splattering and spilling when taking a swig, while the positive lockout lid ensures leak-proof transport. The 100% BPA & BPS free Tru Taste polypropylene with HydroGuard keeps your water tasting clean and refreshing instead of like warm plastic. The Podium Big Chill water bottle is not only easy to fill with ice and water, but it's also easy to clean and rinse thanks to its wide-mouth opening. The Podium® Big Chill Bottle is dishwasher-safe and easy to clean. Remove the cap assembly, making sure the Jet Valvelockout is open, and place it with the bottle on the top rack of your dishwasher. For best results, we recommend avoiding high-heat settings such as 'sanitary clean' or 'heat boost' which may distort plastic components. We don't recommend forcing a brush or other cleaning tool through the Jet Valve cross-slit (i.e. where you drink). You can also watch the video on how to wash your CamelBak bottle by clicking the Video tab. I've had a set of these bottles for nearly two years now. They still look great, they don't leak, and they function flawlessly. Camelbak valves are excellent. Lots of water with ease. It doesn't leak and there is a lock so you don't accidentally squeeze the bottle and squirt. This iteration of the Big Chill is taller than the last one. I purchased 2 replacement bottles and they do not fit in the seat tube cage of any of my 3 bikes. My bikes are 19" frames. Road, Mtn and hybrid. I have several of these bottles. I was using the standard Podium bottle until I tried these. If you fill and freeze about half the bottle your water will stay nice and cold for a two hour plus ride when it's in the 90's. Love these! The Camelbak Podium bottles are the best out there. The Big Chill is quite a bit taller than the regular 24 oz version, so fit could be an issue with smaller frames. The Big chill will keep water colder,longer for sure! It keeps the cold stuff cool even after an hour of riding. Clearly it is not supposed to be a refrigerator, so it's limited in how cold it can keep things. But drinking out of this is way better than a nice warm gulp of water at the end of a long (and maybe dusty) ride. In hind sight, I probably should have just gotten the bike bottle instead of the podium bottle. But that is on me. And in the end, this will get used regularly and I'm glad to have it. No complaints. I got this bottle for my longer trips. Love it! Just the bottle you need. Nothing more nothing less. Awesome water bottle. Keeps water cold for a long time. Unfortunately it's too big to fit in the standard bottle holder location on my mountain bike frame. Jenson is the best place to buy bikes and bike gear on the web! The bottle is definitely an upgrade, however it makes strange noises sometimes (pop pop popping). I recommend this bottle. The hello is tough and works well. I bought it because of its 25 ounce size. Even with an XL size mountain bike frame it barely gets in and out. Does this fit in a standard bottle cage? BEST ANSWER: The bottle does fit in a standard cage, it is just taller than a normal bottle. My only problem with it is that while the divots in the sides of the normal bottle are perfect height for the cage's top frameside retention, this bottle's divots are a little higher. This is mostly aesthetic, and has not affected retention for my riding at all(road and mtb trail). Diameter-wise, yes, it does. Depending on the design of your cage (if it has the goose neck at top), it may be a bit tight, and it will most definitely extend beyond the top of your cage. However, I have successfully carried mine through some rugged MTB trails and never lost a bottle. Yes, it fits. Like all tall bottles, there will be two inches of bottle extending out of the cage. No problems with retention. Yes, I carry two of the 25oz bottles on my Salsa El Mariachi mountain bike. And the lime green looks cool with my orange bike. Yes it does it's just long so it sticks out a bit. I'm using two Profile Design Fuze cages with these bottles. 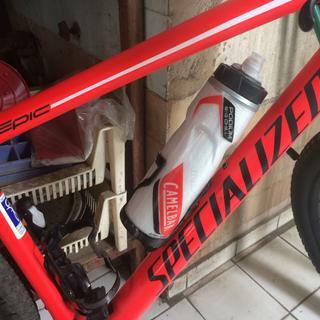 Yes this bottle fits perfectly without any issue in my road bike and 29er bottle brackets. I have a few of these bottles and they fit fine in my standard water bottle cage. It fits the diameter but it's too tall for my seat tube cage. Yes it fits very well. A little snug but I prefer it. Yes. It will fit into a standard bottle cage. Yes, it does fit in a standard bottle cage. Yes it will fit a standard bottle cage.